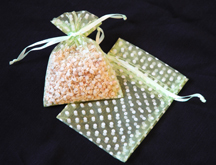 Our 3" x 4" Organza Bags are the perfect packaging item for Aroma Beads! Unlike other bags organza is see through, making packaging the beads a more visual experience for your customer. Organza bags are also popular for packing small jewelry boxes, jewelry etc., great for packing small items for birthday parties and baby showers too!